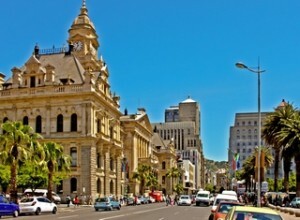 By 1900 the expanding municipal departments, had outgrown the limited accommodation in the Old Town House. The Town Council authorised the construction of the existing City Hall, which was completed in 1905. The Mayor of Cape Town, Councillor Thomas Ball, laid the foundation stone on The 29th of August 1900. 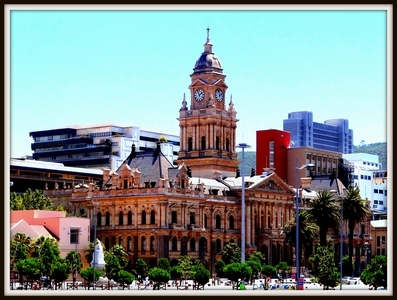 One of the last important functions to take place at the Old Town House was the reception of the Duke and Duchess of Cornwall and York, later King George V and Queen Mary, on their visit to Cape Town. 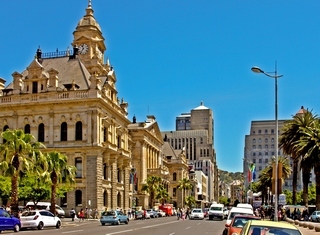 The South African War was still in progress and military forces were very much in evidence in Cape Town, which recently had mourned the death of Queen Victoria. Bordering the Parade, facing the sea, it was designed by the architects Reid & Green in the Italian Renaissance style and built of golden Bath stone. 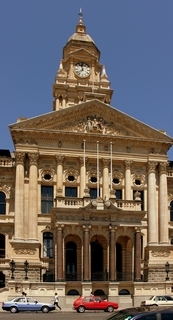 The City Hall marked the apex of the imperial relationship, reflecting the civic pride of Britain’s industrial cities, and the final rejection of the Dutch town. The organ in the Grand Hall was specifically designed for the hall by Sir George Martin, organist of St. Paul’s Cathedral London, and has over three thousand pipes. The clock in the turret is modelled on Big Ben and is exactly half the size, the dials being 10 foot 6 inches in diameter. Originally consisting of thirty-seven bells it was first rung on the 30th April 1925 when the Prince ofWales visited this country. Each bell is inscribed to a brigade, regiment or group of men who fell during the Great War, or to the donor of the bell, including one, which bears the names of municipal employees who died on active service. Two extra bells (treble C and C sharp) were added in 1954.